Set up by college friends Sahiba Singh and Aastha Gulati, Nivesaa literally means a�?investmenta��. 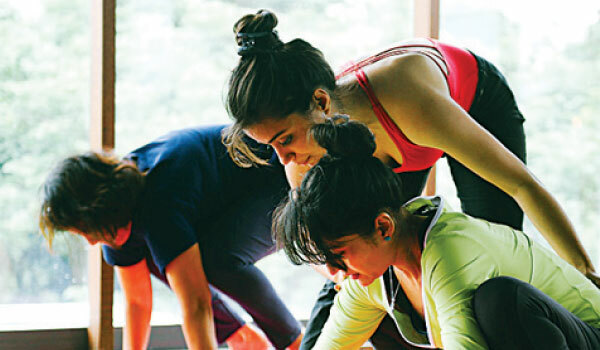 With two studios, a recreation space, therapy room and breezy terrace making up the 3,200-square-foot space in Indiranagar, the centre is set up for dance and fitness classes as well as workshops and one-on-one therapy. a�?We have a three-layered approach, which is made up of Move, Connect and Transform,a�? explains Singh. Move, incorporating fitness classes such as yoga, Pilates and Zumba, is seen as the a�?first stepa��, while Connect, incorporating dance styles like Latin, Bollywood and belly dance goes beyond the physical, encouraging participants to let go of their worries while learning something new. Transform, the final step, is handled by Gulati, and offers hypnotherapy, pranic healing and self-empowerment sessions. a�?We believe that the mind and the body are linked. So for example, if you want to lose weight, you have to tackle your thoughts and emotions as well as think about nutrition and exercise,a�? explains Gulati. Apart from their novel, holistic approach, the duo are some of the only practitioners in India to offer aeroyoga, having trained in New York and Bangkok. Practised with specially-designed hammocks which hang from the ceiling, ita��s becoming increasingly popular in the US. a�?It helps to support inversions, and the hammock acts like a prop, to help you find your strength,a�? says Singh, elaborating, a�?Yoga is all about your spine, and this is a way that you can work on lengthening it.a�? Aside from that, students can sign up for the signature zumba-lates, which capitalises on Zumbaa��s cardio workout power to increase the a�?corea�� strengthening offered by Pilates.